Brenda Wallace is a distinguished leader in the field of teaching writing and reading. Brenda has graduate degrees in education and in writing from Columbia University's Teachers College and from Columbia University's School of the Arts in NY. As a consultant, she partners with district leaders, principals, coaches, staff developers and teachers to implement writing and reading workshop in classrooms nationwide. 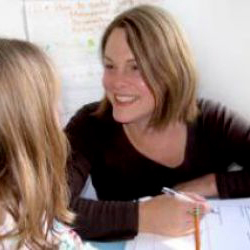 Brenda began her work as a professional developer with Columbia University Teachers College Reading and Writing Project. In NYC, she also worked as a literacy staff developer with the nationally recognized Community School District 2 and as co-director of the K-8 literacy initiative, with Susan Radley Brown, in District 15 in Brooklyn. Since then, Brenda has worked in partnership with nonprofit organizations such as the Noyce Foundation, with the Every Child a Reader and Writer program, the Carnegie Foundation, and with school districts across the country. When working with educators, Brenda combines her passions for writing, for teaching, and for inspiring teachers and students. Currently, Brenda lives in Northern California and is the lead consultant of Accelerated Literacy Learning's West Coast Division.